It was announced Monday that AutoJini.com — which provides dealers with a Web-based software suite of solutions — has launched an eBay Motors Auction Management Tool. This solution is specifically built for dealers listing cars on eBay Motor Auctions, and it is designed to help them simplify the process of doing so through “one simple control panel,” the company said. The listing process is automated, which can cut down on the amount of work the dealer has to do when listing the vehicle and during the follow-up process. It is designed give the dealer control and save him or her time, while also providing “enough information and flexibility in how his vehicles are listed to allow him to customize his strategy for all of his listings,” the company explained. Additionally, the auction management tool also gleans data from bidders and bidding trends. The dealer is provided real-time status on all bids, the best offers and bidder information. There’s a new leader in performance, breaking a Subaru streak, reports TrueCar.com in announcing its Performance Scorecard results for October. This time, the highest grade by manufacturer went to Toyota, snapping a four-month streak in the lead by Subaru, which tied with BMW for second place in the manufacturer’s slots. Jaguar Land Rover placed third. Showing the lowest performance grades by manufacturer were Suzuki at the bottom with a D-minus. Mitsubishi came in next to last, and Mazda and Volvo tied for the third lowest spot. The manufacturers showing the largest gains from September to October 2012 were Ford, jumping from C-plus to B, and Volvo, moving from D-plus to C.
Suzuki, from C-minus to D-plus. In brand rankings reported by TrueCar, Scion and Land Rover tied for the top spot with A-plus grades. A three-way tie for second place went to Toyota, FIAT and Subaru, while Audi, BMW and Lexus all tied for the third-highest grade. On the lower end of the grading, Suzuki earned a D-minus to land at the bottom of the list. The next to last spot went to Mitsubishi and Mazda in a tie, while Jaguar, Volvo and Nissan tied for the third lowest grade. The scorecards grade each manufacturer and brand on eight different measurements, the company said, including pricing, sales, incentives, customer loyalty, market share and days in inventory. For more information on the Performance Scorecards, visit blog.truecar.com. Litigation and settlements associated with what legal experts have warned dealers about — compliance in connection with advertising — were back at the forefront again last week; this time in the Pacific Northwest. A potential scenario discussed in Auto Remarketing’s special issue focused on advertising coming on Dec. 1 played out between Performance Nissan and Performance Kia, dealerships in Everett, Wash., and the state’s attorney general. Nicole Munro, a partner with Hudson Cook LLP who was appointed as the youngest chair ever of the American Bar Association’s consumer financial services committee, articulated several questions dealers should answer when it comes to their advertising initiatives. —Are dealers offering the product they say they are? —Is the product compliant with state rules and regulations governing advertising? —Are dealers really monitoring the advertising they’re doing or are they relinquishing rights to various third parties? Based on the lawsuit the Washington attorney general’s office brought against Performance Nissan and Performance Kia, prosecutors firmly believed the dealerships did not comply with the points Munro raised. In a settlement reached last week, store owner Hugh Hall will pay $150,000 in attorneys’ fees and penalties to resolve the lawsuit first filed back in 2010. The attorney general said Performance Jeep-Eagle, the business that operated Performance Kia and the former Performance Nissan, is also on the hook for another $55,000 fine if dealership practices — what officials called violations of the Consumer Protection Act and other state laws — continue. Hall issued a statement following the settlement announcement. “Performance Nissan and Performance Kia signed a consent decree ending a two-and-half-year dispute with the Washington State Attorney General over alleged violations of consumer protection laws,” Hall said. “We were ready to go to trial as we felt we would prevail, but agreed to settle the dispute in order to avoid the high cost of litigation and the uncertainties inherent in any trial. The agreement does not contain any admission of violation of any law, nor does it represent agreement with any of the allegations made by the attorney general's office,” Hall continued. “In fact, we absolutely and flatly deny that any laws were violated,” he went on to say. “We continue to operate our business as we always have … in an ethical manner, compliant with the laws of the State of Washington. This is reflected with the attorney general dropping many of its original allegations including ‘packing’ and ‘bait and switch,’ neither of which is contained within the consent decree. “We are surprised by the press release by the attorney general’s office as it is not representative of with the tone or substance of our settlement discussions with them and contains innuendo an inaccuracies we feel are inappropriate,” Hall added. As the dealership owner referenced, the version of the settlement agreement Washington’s attorney general’s office released contains language Hall mentioned. Officials said a 2010 lawsuit was filed after numerous consumer complaints to the attorney general’s office. Even while the lawsuit was pending, officials indicated consumers continued to complain. “One complaint described Performance Kia’s television commercials for the Kia Soul. The ads claimed the dealership was over-stocked with the compact cars supposedly marked down to $9,988, along with guaranteed trade-in values of $4,000,” the attorney general’s office said. “But the reality, according to consumer complaints, tells a different story,” prosecutors continued. “One consumer complained that when they visited the dealership, none of the advertised vehicles were on the lot. Performance relied on language buried in the television ad that was ‘one only.’ A sales associate also claimed the trade-in offer did not apply to the Kia Soul. The attorney general’s office also shared communication it received directly from consumers. Assistant attorney general Mary Lobdell shared her reaction to the consumer’s letter and the dealership’s advertising campaign. “We were surprised because we don’t approve television commercials. We’re not authorized to do so and we certainly don’t approve of these kinds of sales tactics,” Lobdell said. “We also don’t approve of ads that show pictures of junkyard jalopies, suggesting the dealership will pay $2,000 for trade-ins, no matter what condition, because we know that offer is seldom honored,” she continued. The attorney general’s office also shared another consumer complaint that included “bait and switch” language. Officials said one consumer who complained when the dealership did business as Performance Nissan spoke of seeing a promotion for a Nissan Altima. Selling a vehicle at a higher price than advertised is a violation of both the revised code of Washington and Washington Administrative Code, according to the attorney general. No matter, officials said the settlement filed in Snohomish County Superior Court resolved the attorney general’s 2010 lawsuit against Performance and established a commitment by the dealer to revise its policies and practices. —To write policies and procedures that promote lawful and ethical sales and advertising practices and to train, monitor and discipline employees appropriately. 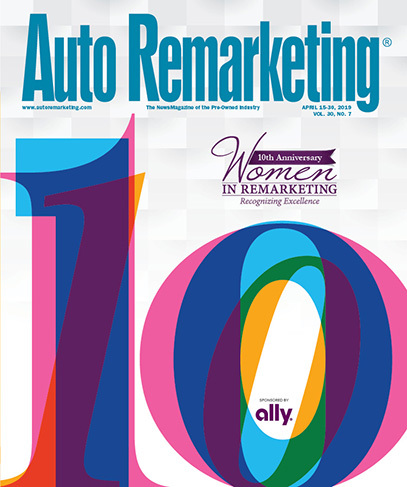 More commentary and strategy recommendations regarding dealer advertising is contained within Auto Remarketing’s Dec. 1 print edition. The success of this year’s Used Car Week is already pushing organizers to get ready for the 2013 event. The series that included the CPO Forum, the Re3 Conference and the National Remarketing Conference drew dealers as well as automaker and auction company executives from throughout the country together for five days of events at The Phoenician in Scottsdale, Ariz.
“Used Car Week was an outstanding success again this year,” conference chair and Auto Remarketing publisher Bill Zadeits said. “The industry experts on hand throughout the week, the sharing of insights, projections and best practices as well as all of the networking opportunities were second to none. “I would like to thank everyone involved who have made Used Car Week the signature event in our industry. We’re already looking forward to next year’s conferences,” Zadeits added. Auto Remarketing’s coverage of Used Car Week — including features from many of the panel sessions as well as photo galleries — can be found on this page. Customers may return to the lots sooner than expected after Hurricane Sandy. In fact, according to a report released by Dataium late last week, auto shopping is already showing signs of recovery from the storm. “The report reveals that while online auto shopping declined in the days preceding the storm, the trend started to reverse course on Oct. 29, the day the storm made landfall,” officials shared. Eric Brown, Dataium chief executive officer stated, "The pre-hurricane data speaks to the power of uncertainty to impact consumer behavior. The post-hurricane data speaks to the heart and soul of the American consumer to rise above tragedy and persevere." That said, the damage caused by the hurricane has still prevented some Northeast consumers from continuing their vehicle searches. Interestingly, after dropping in the days leading up to the storm, lead submissions on dealership websites increased 12 percent the day the hurricane made landfall, Dataium shared. Conecticut and Virginia saw the biggest jumps during this period — up 55 percent and 25 percent, respectively, from the previous day. On the other hand, some of the states most impacted by the storm had less encouraging results. Maine and New Jersey were the only states impacted by the storm to show declines on Oct. 29, down 39 percent and 16 percent respectively. And are some brands faring better than others? According to the report, imports are seeing slightly better numbers than domestic counterparts, “experiencing a small, but speedier resurgence from the considerable declines on the days that preceded the storm. "Despite the prevalence of large incentives and special pricing currently being offered by almost all auto manufacturers, only a few brands, like Nissan for instance, have exhibited consistent growth in lead submissions post-hurricane," officials concluded. RVI Group recently shared its most recent wholesale used vehicle price analysis, finding that used-car prices went up slightly in October. Analysts determined wholesale values (seasonally adjusted on two- to five-year-old vehicles) saw a small increase of 1.4 percent in October when compared to a month earlier. On a year-over-year basis, prices moved up 4.1 percent. “Due to the damage caused by Hurricane Sandy, there is a possibility we will see increased demand for new and used vehicles in the next few months, which could result in higher prices similar to the aftermath of Katrina,” RVI analysts said. When tracking price movements by vehicle segment, analysts found that full-size sedans (up 4.7 percent), small sedans (up 2.6 percent) and midsize sedans (up 2.1 percent), all saw increases above the market average from a month ago. Full-size vans (up 3.5 percent) and sports cars (up 3.3 percent) also landed in that group. Meanwhile, RVI noticed that full-Size SUVs (down 0.6 percent) made up the only segment that showed a drop in prices from September. And wrapping up its latest report with a quick look at new-model trends, RVI indicated new-vehicle transaction prices on a seasonally adjusted basis, ticked down 0.1 percent from August to September. However, new-vehicle prices have increased 1.0 percent since September of last year, according to analysts.